So you want to run online ads? Digital ad spending now surpasses TV ad spending, and for good reason! In this post, I’ll walk you through most of your options for online advertising. That’s why I put together this list of 12 online ad formats you should be considering, and why they’ll work for you. These are likely the ads you’re most familiar with. Google search ads appear in Google’s search results, either alongside or above the results. You’ll often hear them referred to as Google AdWords as well. They’re based on keywords, and whenever a user enters a search query that contains one of your keywords, your ad may show. They operate on a cost-per-click (CPC) basis, meaning that you only pay when someone clicks on your ad. Consumers rely heavily on the use of search engines to make buying decisions. In fact, 72% of consumers prefer to find information on local merchants via search. And when it comes to search engines, Google reigns supreme, owning 71% of the search market share. I think it’s safe to say that your audience is using a search network, and Google is your best bet at reaching them. Beyond that, search ads offer a high ROI. On average, businesses make $2 for every $1 they spend on AdWords. Bing ads work similarly to Google AdWords ads. 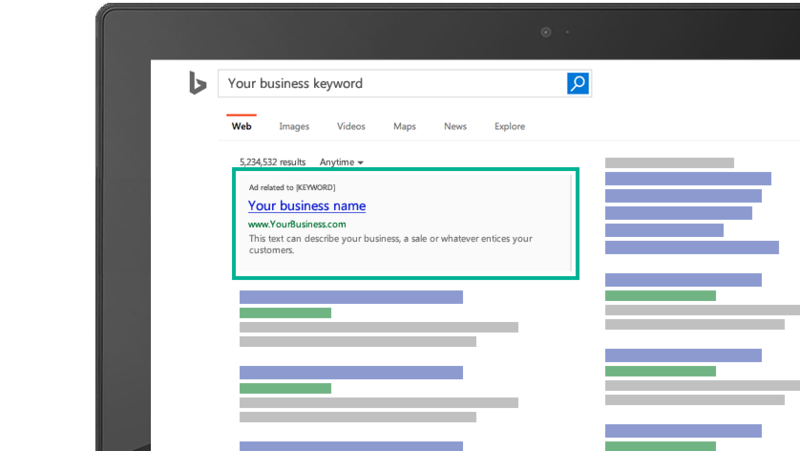 They too operate on a keyword-driven, cost-per-click basis, and are meant to show on the Bing search engine and network. You can choose between multiple types of ads – from text ads like you’d normally see in search results to shopping ads meant to display specific products and catalogs. Now, I know what you’re thinking – Bing’s no Google, so why are they on the list? Reason one: True, it’s no Google. But Bing’s still relevant, and 1 in 5 people use Bing for online searches. Reason 3: There’s less competition on Bing, which in ad terms translates to better ad positions and cheaper costs per click. Those stand pretty heavily in Bing’s favor, with cheaper costs and bigger returns. Facebook ads are some of the most exciting in the space right now. And if you’re not already, it’s high time you considered them. Facebook ads take many different forms, and can appear as promoted posts, image or video ads right in your newsfeed or in the margins. Facebook remains the most popular social media channel – for both users and marketers, and has the biggest blend of demographics. Learn 4 steps to successful Facebook advertising here. Twitter ads refer to promoted tweets, accounts, and trends. Through promoted tweets, advertisers can increase the reach of their tweets and ensure that they end up in more of their audience’s feeds, while promoted accounts increase the number of times a brand will show up in the Who to Follow section. Promoted trends, on the other hand, will promote your custom hashtag in the trends margin. Twitter is still a big deal on the social media scene, and is especially useful for brands looking to engage with their audience. In fact, 66% of Twitter users have discovered a new small or medium business on Twitter, and 94 percent plan to purchase from the businesses they follow. That number alone pretty much makes my case, but I won’t stop there. From a practical standpoint, Twitter takes the cake on costs. With promoted tweets, you only pay when you’ve met your marketing objective. For example, if your goal is more followers you only pay when someone follows you. And, though less well-known than Facebook targeting, Twitter offers its own impressive targeting features. Case in point: Tweet engager targeting. This is Twitter’s brand of remarketing, which allows you to target users who have viewed or engaged with your tweets, or viewed 3 seconds (or 50%) of your video. So if you’re looking for the biggest bang for your buck, Twitter may be one of your best options when it comes to online ads. Another option for social media advertising is through LinkedIn. You’ll see these in various formats as well, from sponsored content on the homepage to sponsored inmail in your inbox. Like Facebook, the ads are sold at auction, meaning you bid against advertisers trying to reach the same audience. I’ll be honest here: LinkedIn ads aren’t for everyone. They can be expensive, and not all businesses are suited to LinkedIn’s audience. That said, Linkedin offers major benefits to those that do use the platform – mainly B2Bs and recruiters. People go to LinkedIn for a reason, usually looking for answers to professional problems or for a qualified recruit. Studies show that 80% of B2B leads come from LinkedIn, and 94% of B2B marketers use LinkedIn to distribute content. Think about that number for a second: 80%. That’s over three-fourths of B2B leads, and if that happens to be your target audience, you simply can’t afford not to use LinkedIn. But that’s not all. On average, 46% percent of social media traffic coming to B2B company sites is from LinkedIn. So I’ll say it again: if you’re a B2B, you should be using LinkedIn online ads. Google Display ads are the lesser-known counterpart to Google search ads. While you may not be as familiar with them, you’ve almost certainly seen them. Display ads pop up on websites, YouTube videos, even your Gmail inbox. They’ll often come from sites you’ve recently visited or products you’ve recently searched for. They appear on websites based on potential buyer’s interests, previous search history, demographics, etc., and like search ads are targeted are heavily reliant on keywords. You have the power to control which kinds of sites (or even which sites specifically) you would like your ad to appear on based on the kind of audience you’re targeting. Google display ads serve a different purpose than search ads, and whether you choose one or both will depend on your objective. Display ads tend to work best for bottom-of-the-funnel sales activity like brand awareness, because it targets users who aren’t necessarily in the buying process yet. That being said, the Google Display Network has tremendous reach – it’s comprised of 2 million websites and 90% of internet users. For advertisers, that means a big opportunity to get their ad in front of the majority of users. To make sure your ads are reaching the right part of that 90%, Google offers plenty of advanced targeting options including contextual keywords, demographics, interests, remarketing, topics, similar audiences, etc. To make the most of your ads, check out these tips. Remarketing ads (also called retargeting) are some of the buzzed about in the biz right now. Remarketing lets you target your ads to people who have already visited your website. When a user visits your site, a cookie is attached to that user. Then, when they visit another site, that cookie allows your ad to be shown to them. These ads will be found on specific networks like the Google Display Network, LinkedIn, Facebook, or YouTube. Remarketing ads should be run with their own strategies. You’ll need to think about what page a user initially visited when they came to your site so you can serve them ad specific to what they were looking for. What makes remarketing ads so effective is that they target people who already have a proven interest in your brand. Think about it; for most sites, more than 90% of visitors leave without converting or buying. In the past, that was just lost traffic, leads, and sales. But through remarketing, we have a way to identify past visitors and reclaim their interest. If that alone isn’t enough to sway you, then consider this: remarketing has an exceptionally high ROI, due to its ability to track user’s behavior and speak directly to them through segmented ad copy. It seems all marketing channels are making the move towards mobile, and online ads are no exception. They’re pretty straightforward: mobile ads are any ads that appear on any mobile device, including smartphones and tablets. Simply put: it’s where your audience is. More and more, users are turning to mobile devices to search the web, browse social media and even make purchases. In the US alone, adults spend 3 hours and 15 minutes on a mobile device every day. 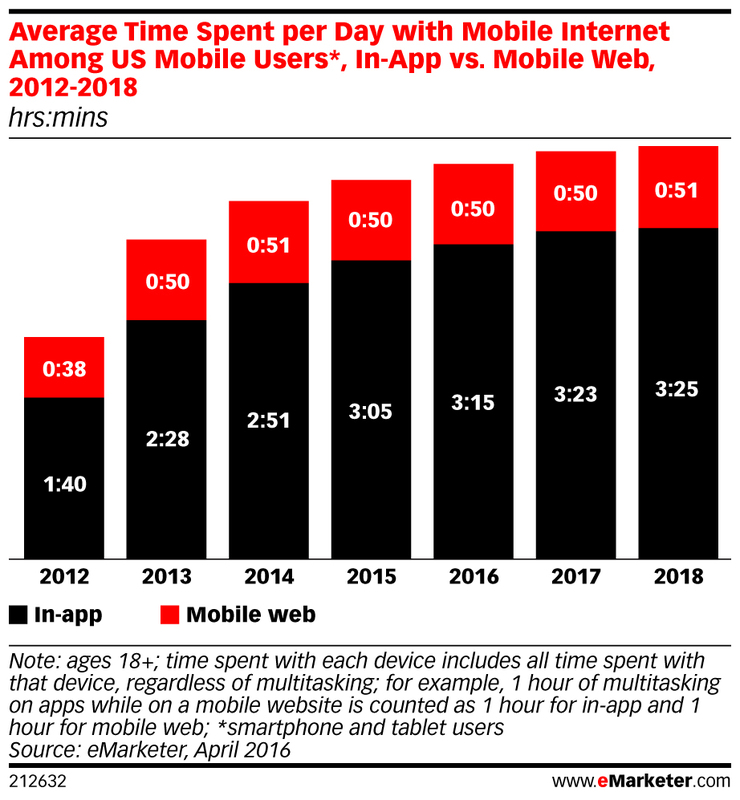 Marketers are well aware of that, which is why mobile advertising is expected to outgrow all other digital ad platforms. Not only that, but experts predict that desktop spend will reign in at around $25 billion in the next few years, while mobile will make up massive 72% of total spend by 2019. So if you want to stay in the game, mobile’s simply a must. When it comes to email, there is of course traditional email marketing. But you can also advertise actual ads in people’s inbox. The first appears in inboxes much like any other email, with a subject line that (hopefully) compels the user to click on the email. Once they do, it will open your ad in the body portion of the email. These can be used in traditional email campaigns and sent through software like MailChimp, or Google Display Ads can be sent to user’s Gmail account. The ads usually feature a large, static image with a minimal amount of text. Email is one tried-and-true marketing channel that isn’t going anywhere. Email is the preferred method of commercial communication; 72% of people prefer to receive promotional content through email marketing, and email is 40 times more effective at acquiring new customers than Facebook or Twitter. Now when talking about actual ads, those also work. The advantage of ads, especially when using the Google Display Networks, is that they can target users based on keywords, topics, remarketing lists, etc. Video is another online ad channel that can’t be ignored. Video ads are ads that feature a video as their creative, rather than the standard image. Some of these take on the traditional commercial approach, featuring the product and how it can be used, etc. But some of the most successful instead feature how-to’s and educational content rather than direct product pushing. Video is quickly becoming the preferred means of content consumption for users. On Facebook alone, 100 million hours of video are watched every day. I think the numbers speak for themselves on this one. Video has proven more popular and to produce more engagement than traditional text and image messaging, and that extends to online ads as well. 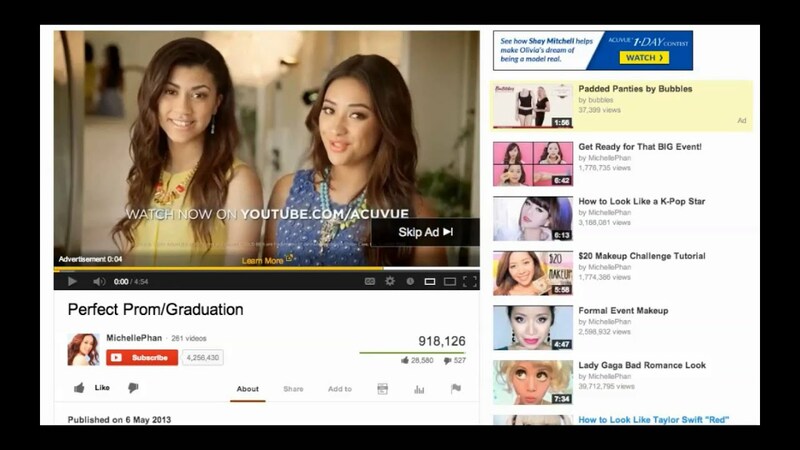 YouTube ads are a type of video ad that plays before or during a YouTube video. Both of the TrueView options are paid on a PPC basis, so you only pay when someone clicks on the ad. Bumper ads are paid per impression. We already covered how important video ads are. Now let’s talk about YouTube specifically. The channel boasts 1,300,000,000 users, and almost 5 billion videos are watched on Youtube every single day. It’s the second most popular search engine on the web, second only to Google, which means that it gives brands a good opportunity to reach users they might not normally find on other social networks. Beyond its impressive reach, YouTube also has some of the lowest starting prices and comes with great targeting options to ensure you reach the right audience. Instagram ads are just that: ads that run on Instagram. The great thing about them is that because Instagram is owned by Facebook, it uses the same impressive targeting abilities and bid system to set up your ads. Instagram ads are newer to the scene, but have quickly earned their keep. In their first year, Instagram ads pulled an impressive $595 million in ad revenue. Just a few years later, it’s expected to bring in $1.53 billion in mobile ad revenue worldwide. It’s one of the fastest growing social media platforms (brand follower growth increases by 6% to 8% month over month), which makes it perfectly suited for audience and follower growth. Why advertising? Because organic growth is hard to come by these days, and Nielsen recently found that ad recall on Instagram exceeded the norms for online advertising by almost three times. Google AdWords is the system used to run Google Search and Display ads. All ads are subjected to the ad auction, where Google selects ad placements and rank based on keyword selection and relevance to its search audience. It’s a major source of revenue for Google, providing 95% of its revenue. While that’s great news for Google, it’s good for brands too. Google could only command that amount of revenue from a platform that really works. Of all the advertising platforms, Google accounts for 33% of all online ad revenue. For businesses, that signals that they’re most willing to invest – and trust – the AdWords system to deliver the biggest returns. PPC refers to pay-per-click ads. As you may have noticed, a number of the platforms listed above rely on a PPC pricing model. In a PPC set-up, businesses only pay a fee when a user clicks on their ad. How much you pay per click will depend on your overall campaign budget and how competitive your keywords and niche are. Google and Bing both use a PPC, as well as Facebook, YouTube, and many others. Tumblr is another popular platform open to advertisers. While not as well-know as an advertising platform as networks like Facebook and YouTube, Tumblr is still home to over 200 million blogs, and 80 million posts are published a day. Even better, Tumblr is ranked #1 in social sentiment towards brands. That means that users are more receptive and have a more positive attitude towards ads on Tumblr. I’d say that’s a pretty good reason to look into advertising options on Tumblr. Banner ads can be found on websites all over the internet. They’re the ads that run at the top, sides, or bottom of a site. These are commonly run through the Google Display Network, though they can be purchased separately. The case for banner ads is similar to that of Display ads. They serve a very specific purpose – mainly brand awareness and bottom of the funnel sales activity – but can be useful based on their ability to target users specifically by keywords, interests, etc. Keep in mind that less is often more with these ads. Pop-ups and videos are more likely to be obtrusive and be seen as negative, so it’s generally best to keep ads to a simple format. Reddit has long been the go-to spot for viral content and open forums, and believe it or not, can be a goldmine for online advertising. Not only is it extremely popular (more than 1.2 billion people visit each month), but it offers a unique opportunity to target your audience through subreddits. Subreddits are niches within Reddit dedicated to certain interests, which makes finding your particular audience a cinch. In-game ads are just how they sound: ads that appear in a game, usually a video game played online. They can pop up in banners throughout the game, though are often displayed as video ads when you download free content. And though you may think these serve more as distraction than anything, they actually really work. Their effectiveness, however, depends largely on your target audience. If you’re serious about in-game ads, Twitch may be the one best places to test the waters. The gaming platform has over 2 million creators on the network, made up of an extremely engaged audience that spends an average 1.5 hours a day on the service. If you’ve ever downloaded a game for your smartphone or mobile device, you’ve almost certainly encountered an AdMob ad. AdMob ads work just like in-game ads, only they’re used on mobile devices. Google even has its own dedicated platform called Google AdMob. The cool thing about them is that though they can be a nuisance for users, they generally allow a game to be downloaded for free, which makes users more receptive to them. Not only that, but mobile games continue to be one of the top-grossing sectors in the gaming industry, expected to represent over half of the total gaming market by 2020. Pinterest is yet another extremely popular social media channel – for both users and advertisers. One of the biggest benefits it serves as an advertising platform is that it’s dominated by a clear target audience: affluent, millennial women. Any business that caters to that demographic should be looking into Pinterest. Beyond that, it’s a perfect platform for e-commerce brands. According to Pinterest, Pinners are likely to spend 50% more on average compared to other social networks, and 87% of Pinners have purchased a product because of Pinterest. Though there’s been a considerable move toward digital over the last few years, TV ads are still alive and well. The fact remains that people are still watching plenty of TV (the average American watches 5 hours per day! ), which means that tv ads are have the potential to reach an extremely large audience. So who should use them? Because TV ads are some of the most expensive, bigger brands targeting an adult audience tend to see the best returns. Similarly, newspaper ads don’t seem to be going anywhere – at least not for some time. According to Nielson research, 70% of the population still read newspaper regularly. Whether or not it’s the right platform for your businesses will have a lot to do with your target audience. Nielson also found that readers tend to be educated, affluent, and professionally employed. It also tends to be a better a option for local businesses who can capitalize on local magazines and papers. I’ll give you this one; traditional radio ads probably aren’t your best bet. But here’s the thing: these days, “radio” ads can now include everything from popular music services like Pandora and Spotify to new source Podcasts. And those are not to be ignored. In general, it’s harder to target niche audiences through radio, so it tends to work better for bigger, broader businesses. This one needs no explanation. They’re big, in your face, and great at commanding attention. That said, they tend to work best in dense, urban areas for big brands looking for shock value or to spread a message, and whose goals are brand awareness and branding. 1. Can People Block Online Ads? Yes, it’s possible to block online ads. As you can imagine, most digital marketers don’t like the fact that web surfers can do that. There are a couple of different ways that folks can block ads. The first option is to use an extension like AdBlock. That gives users the ability to block all ads. Alternatively, some people might be a little more selective about the ads they block. To do that, they can just click on the info icon on a Google ad. Then, they can click on the “Why This Ad?” link and opt to turn off all ads from that company. 2. How Much Do Online Ads Cost? Many online ad markets use an auction system. That means you’re often bidding on the amount of money you’ll pay for an online ad. In other words, you’ll pay a premium if you want to advertise on a popular website or display an ad for a competitive search term. 3. Why Are Online Ads Effective? Measurability – Unlike with TV or radio ads, you can “follow the money” with online ads to see which strategies are contributing most to your bottom line. Scalability – Once you find the strategy that’s giving you the most bang for your buck, you can scale it to rake in the cash. Targeting Capabilities – With media ads, you’re usually promoting your brand to wide cross-section of the population, many of whom won’t care about what you’re offering. With online ads, you can target exactly the right audience. Return Potential – You pay only when people click on your ad. That means you’re spending cash exclusively on viable prospects. 4. How Can I Create a Customer Journey With Online Ads? In fact, the answer lies in one word: remarketing. Start by running ads that appeal to people in your target market based on their demographics and interests. If they visit your website, then your ad platform will put a cookie in their browser so those folks are a target for remarketing. Even better, though: they’ve shown an interest in your brand. That means they’re ready for the next stage of your marketing campaign. Run a remarketing ad to them. When they respond to that, run another remarketing ad that takes them to the next step in the sales journey. Rinse and repeat. Keep the process going until you close the sale. 5. What’s the Best Place for B2B Online Ads? If you’re running a B2B shop and looking for potential clients or customers, you should start with LinkedIn. That doesn’t mean it should be the only social media channel you run ads on, though. Plenty of B2B brands run ads on Pinterest, Instagram, and Facebook. Often, they’re designed to build brand-name awareness. If you’re looking for a quick close in the B2B space, though, LinkedIn is the place to be. 6. When It Comes to Online Ads, What’s the Difference Between CPC and PPC? CPC stands for cost-per-click. It usually refers to the actual price you pay every time somebody clicks on one of your ads. PPC, on the other hand, stands for pay-per-click. Although it’s sometimes used interchangeably with CPC, it usually refers to the type of ad that you’re running. In other words, when you run PPC ads, you’re expecting to be charged per click. 7. Are Online Ads More Effective Than SEO? That depends on the nature of your business and your target market. The advantage of online ads is that they offer immediate results. People will see your ads as soon as you start running them. When it comes to SEO, though, you’ll wait at least six months to see results. However, once you do get results, they could stick around for a very long time. Online ads, on the other hand, will stop appearing once you stop paying for them. 8. What Are Native Ads? Native ads are online ads that look like part of the content on a website. Effectively, they’re ads wearing a disguise. People often click on native ads thinking they’re reading an article that’s hosted by the website they’re visiting. In reality, though, they’re really reading an ad. If you’re interested in running native ads, two of the most popular platforms are Taboola and Outbrain. As you can see, there are plenty of online ad formats out there. But the ones above will likely get you the best returns. Remember, it’s okay to start small. Pick a few channels and start experimenting with ad creative, messaging, and targeting options. As you get a feel for what works for you, you can begin to expand into other online ad channels.